All-terrain, multi-functional footwear with solid support in super lightweight construction. Ideal for day hiking and short-haul, weekend backpacking because they’re phenomenally comfortable, supportive and cushioned. The Zephyr is an ideal 3-season hiking boot, or a duty boot for professionals who serve in a variety of climates and conditions. PU MONOWRAP® frame with comfortable underfoot PU midsole and LOWA Cross sole provide all day comfort. Waterproof/breathable. When it comes to quality outdoor footwear, the LOWA brand is one that always makes the list. LOWA Boots have been considered some of the finest in the world by those who wear them for more than 90 years. In fact, LOWA is the only outdoor footwear manufacturer in the world to be granted ISO 9001 status for their high-quality construction and process standards. LOWA’s Zephyr Mid boot is an award-winning 3-season waterproof hiking boot that is handcrafted in Europe from the highest quality natural and synthetic materials employing all of LOWA’s exacting standards so they last much longer than most alternatives. The result is a superior lightweight boot that provides maximum support for all-day comfort and protection from the elements. LOWA also has an 8″ version of the Zephyr GTX available. The Boot Upper is made from a rugged Cordura nylon for its exceptional breathability, and topped with a high-quality split-leather layered in an attractive skeletonized pattern over the toe cap, heel counter, inner and outer quarters, and along both sides of the boot vamp for maximum strength and durability. The heel tab, boot collar and quarters extend beyond the ankle encapsulating a thick 1/2″ foam padding that surrounds the ankle providing additional comfort and support. LOWA boots utilize anatomically-contoured C4 tongues for a natural flex that cradles the foot in comfort. The length of the tongue is padded, but the gussets remain unpadded so they lay flat. The four main features of the C4 tongue that noticeably increase its comfort include asymmetrical padding where that is thicker towards the outside of the foot, recessed ankle areas where the inside is higher than the outside of the boot, a flexible curved inset towards the inside of the foot, and softer edging around the boot collar for extra comfort. For a supportive fit, free-moving 3/8″ nylon web loops are attached to the boot vamp and lashed in a way that securely grasps the foot. Metal eyelets and hooks are used on the remainder of the boot allowing quick synching of the laces that won’t slip. Attached to the top of the heel counter, there is a 3/8″ nylon web loop for use as a heel pull to assist in taking the boot on and off. The Boot Lining in the GTX model utilizes the GORE-TEX® technology for its exceptional breathability and weatherproof protection. A two-layer lining material is bonded to the GORE-TEX membrane to create the GORE-TEX Footwear System which keeps the footwear insulated and waterproof while remaining breathable. These liners are lasted to the boot for exceptional fit and comfort. LOWA also offers Zephyr models with a quick-drying, breathable synthetic fabric designed for hot weather, but not insulated or waterproof like the GORE-TEX lining. The Boot Insole is a removable climate control footbed with perforations for increased airflow to improve its breathability. The insole consists of a 1/4″ foam fixed to a simi-rigid base and topped with climate-control mesh. Zephyr’s Boot Midsole consists of LOWA’s patented dual-density PU (polyurethane) MONOWRAP® frame technology that is bonded directly onto the upper and sole of the boot through a direct injection process for maximum shock absorption, support and lateral stability in a very lightweight skeletonized frame. This provides excellent foot and ankle protection in rough and uneven terrain, even under load. The MONOWRAP frame also provides heavy-duty toe, heel and sidewall bumpers for better wear and impact protection. The Boot Outsole is the LOWA Cross sole, a part of LOWA’s Task Force line designed with a hiking-oriented tread and a special self-cleaning lug pattern that provides superior traction over a wide range of terrain. It is a softer sole material for maximum shock attenuation. The LOWA Cross outsole also includes a three-quarter length nylon shank for enhanced stability and rigidity under the foot while remaining flexible at the toe for increased speed and agility. LOWA guarantees their footwear will be free from defects in workmanship and materials for a period of 12 months, or according to the applicable law in a given country. If anyone should experience a defect during the warranted time period, or need a boot repaired due to misuse, simply contact LOWA for more details regarding their repair services. Newly purchased footwear typically does not require any additional care before its first use. If it becomes heavily soiled, it should be cleaned with a brush and warm water. Never wash leather footwear in a washing machine. It is imperative to allow your footwear to dry thoroughly after each use, even as far as removing the footbed to help with airing out if necessary. All leather should be treated from time to time with special leather care products to keep the leather surfaces soft and supple, free from drying out or becoming brittle. Even textiles like Cordura nylon should be treated regularly treated to improve their resistance to dirt and water. Especially if they are regularly used in a wet environment. For more details regarding the best ways to care for your LOWA footwear, please visit the LOWA Footwear Care Tips webpage for detailed care instructions. For most footwear, I typically to wear a 10.5 so I was a little surprised that LOWA’s online sizing guide says I should wear a size 9 based on the number of millimeters toe to heel. However, there are no wide-widths available and even the 10 felt too tight in the toe area… And my feet are really not that wide. Therefore, it makes me wonder a little if the online guide is just missing a note regarding accommodating some toe space that you will likely need. In the end, I opted for a size 11 just to make sure that I had plenty of room for thick wool socks when I need them, though a 10.5 would have likely been just fine. Additionally, I spend most of my time in hotter than hot California so I typically do not wear thick socks. As a result, I simply added a thin foam insole insert underneath LOWA’s factory insole to take up some of the extra space and provide a little extra padding as well. After a couple months of somewhat heavy use, I’ve been able to put a fair amount of paved and unpaved miles on these boots in various weather conditions ranging from extreme desert heat to freaky summer rainstorms and cross-stream trails. With or without the thicker footbed, these boots have always remained exceptionally cool and comfortable to wear both on and off the beaten path, and best of all required absolutely no break-in period whatsoever. Though I must to admit the extra padding certainly does provide a higher-degree of comfort. Even with the GORE-TEX liner and thick wool socks the Zephyr GTX boot sized correctly provides ample toe space and airflow, but not so much that my feet could slide around and blister. The MONOWRAP midsole, outsole and upper provide plenty of support, traction and lateral stability, while remaining lightweight and flexible without binding up around the toe or ankle. The boot provides ample movement where you want it, and plenty of rigidity where you don’t. Much needed for trekking through uneven terrain or spending long hours on your feet with aging knees and ankles. After 35 miles or more, the soles barely show any sign of wear at all even though I am known for being very hard them. To further test the water-resistant properties of the boot beyond wearing them around in the rain, I stepped down into a pocket of water completely covering the boot vamp and halfway up the tongue gussets or stay, just not enough to allow the water go over the top. I never felt the slightest bit of moisture inside. I am always amazed by GORE-TEX technology. LOWA’s Zephyr GTX Mid boot seems to be the perfect blend of fine European craftsmanship and durable high-quality natural and synthetic materials. 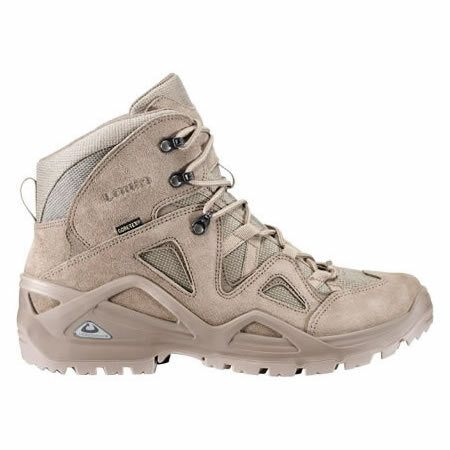 It is a very attractive boot that is not only extremely lightweight and supportive, it also provides an exceptional amount comfort… So much so that they feel more like a high-top sports shoe than a hiking boot that is easily some of the most comfortable boots that I have ever worn and could easily be worn all day, every day. 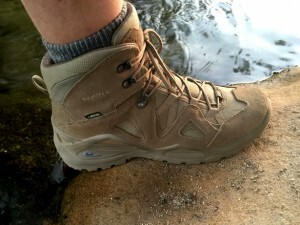 The Zephyr GTX boot is rugged, supportive and waterproof. 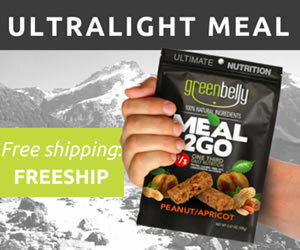 Easily capable of performing, and excelling in some of the harshest environments. 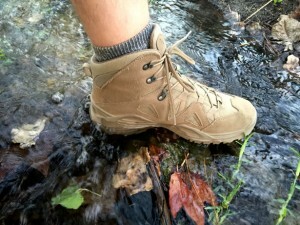 What more could you ask for in a lightweight hiking boot? 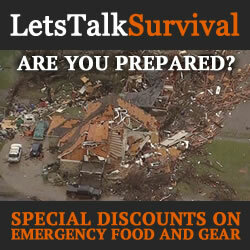 Perfect for the military, law enforcement, contractors, hikers and survivalists alike. At $195 a pair, these boots are definitely not a budget item, but easily worth every penny. For 90 years, LOWA BOOTS have by been acclaimed as the finest outdoor boots in the world by climbers, mountaineers, hikers, the media and certified quality testers. Our attention to every detail in design, sourcing and European manufacturing has earned our reputation for building the world’s most comfortable and durable boots since 1923. We build our boots under the world’s most stringent manufacturing, environmental and labor regulations. We to put into practice what many other companies only pay lip service to: Clean manufacturing, minimal waste and fair labor practices. The result are boots that last longer than our competitors, on average 5 to 7 years.